The weekend will be filled with collegial interaction, stimulating lectures on the latest technologies, and Star Wars themed events providing fun for the whole family! Friday begins with a hands-on embryology workshop sponsored by Cooper Genomics. Friday night you will enjoy the President’s Welcome Reception followed by a thought-provoking lecture from Eli Adashi, tracing the history of reproductive techniques and offering insight into what lies ahead. On Saturday, our talented faculty will present talks on endometrial stem cells, future pre-implantation genetic testing strategies, reproductive surgery updates, cost-effective IVF, the role of genome editing in IVF, current legislation affecting care, and more. Enjoy time with your colleagues at roundtable lunch discussions and complete the conference with a celebration of 30 years of NEFS ~ with trivia and prizes. This course is aimed to meet the needs of clinicians, nurses, embryologists, and other professionals with an interest in the field of Reproductive Endocrinology and Infertility. Understand benefits of PGT-A reviewing strategies and discuss future prospects and challenges. Discuss approaches to streamlining the ovarian stimulation and monitoring process without risking OHSS, review opportunities to improve efficiency and work flow in the laboratory, and discuss the emerging role of intravaginal culture (IVC) of eggs / embryos in the USA. Understand obesity's impact on reproductive health and outcomes and understand risk factors to outline a practical approach for treating obese women. PHYSICIAN: Application for CME credit has been filed with the American Academy of Family Physicians. Determination of credit is pending approval for up to 14 Contact Hours (if you attend the ENTIRE PGS workshop on Friday morning) . AAFP Prescribed credit is accepted by the American Medical Association as equivalent to AMA PRA Category 1 Credit™ toward the AMA Physician’s Recognition Award. NURSE: Village Fertility Pharmacy is an approved provider of continuing education in nursing by the California Board of Registered Nursing, Provider # CEP 16820, is pending approval for up to 8 Contact Hours. Receptions, breakfast, lunch, dinner and breaks are provided by the New England Fertility Society. It does not influence or affect continuing nursing education content or speaker selection and does not represent endorsement by California Board of Registered Nursing. Village Fertility Pharmacy is sponsoring the educational activity for the New England Fertility Society. ABB: This activity is pending approval by the American Board of Bioanalysis (ABB) Professional Enrichment Educational Renewal (PEER) for up to 14 Contact Hours (if you attend the entire Vitrification workshop on Friday morning) of continuing education activity for this program. Updates on the status of accreditation will be posted on the website as it becomes available. 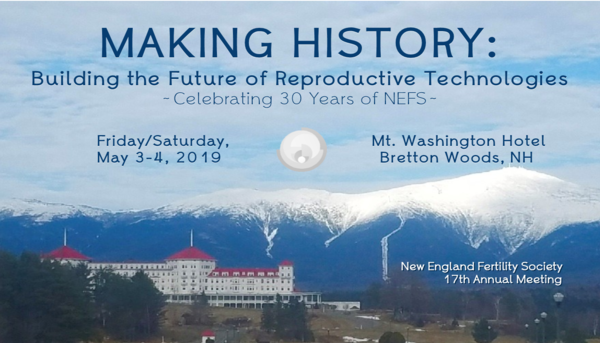 This activity is jointly sponsored by the Continuing Education Company, Village Fertility Pharmacy, American Board of Bioanalysis (ABB) Professional Enrichment Educational Renewal (PEER), and the New England Fertility Society (NEFS).